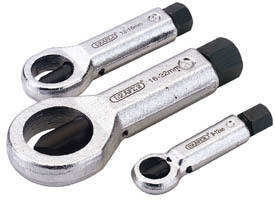 For the safe removal of corroded or damaged nuts without damaging bolt threads. Drop forged steel body hardened and tempered with plated finish. Threaded splitting pin manufactured from chrome molybdenum steel hardened and tempered with chemically blacked finish. Capacities: 9 - 12mm, 12 - 16mm and 16 - 22mm. Display packed.